The health effects of being out of work for men. There seems to be a clear correlation between health status and being out of the work force. Those out of work, at least prime-age men (25 to 54 years), are plagued more often by health issues. 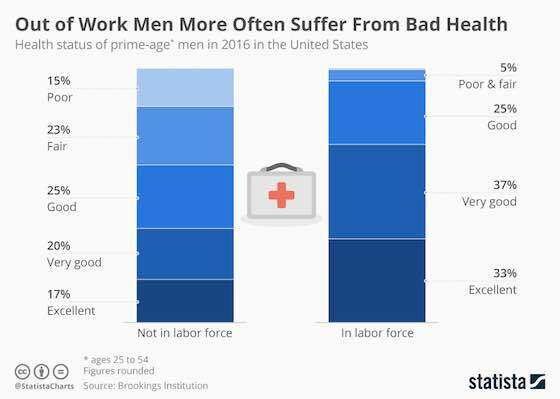 According to Bureau of Labor Statistics' (BLS) data quoted by the Brookings Institution, prime-age males out of the work force are more likely to report that their health is "fair" or "poor" compared to a male in the labor force (37 percent versus 5 percent). Of course, the data doesn't show if in some cases the reason for somebody being out of work in the first place might have been his poor health. The chart above shows health status of prime-age men (ages 25 to 54) in the United States.